This re-release comes fully loaded: including all previous DLC, the Marvel vs. Capcom: Official Complete Works art book, and boasting full HD 1080p resolution at 60 frames per second. 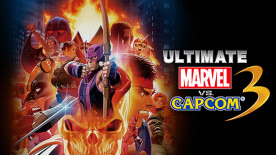 Select some of the most iconic Marvel and Capcom characters, and customize your team with "Heroes and Heralds" mode. Once you've honed your skills, hop online and go head-to-head against players from around the world to see who is the strongest in the universe. Enhanced Modes: Spectator mode is available as part of an overall improved online experience. Heroes and Heralds is a single player and multiplayer, team-based mode where you unlock brand-new abilities with upgrade cards, customize your favorite character with new powers and compete in groups as either Heroes defending Earth from Galactus or as one of Galactus’ Heralds.